Dawn began a successful 30 year career with the Scotiabank in Winnipeg Manitoba. She was transferred to Alberta and then B.C. where she spent the majority of her banking years. Eleven of those years were spent managing branches in the Okanagan and Shuswap areas. Dawn has always given back to the communities that she has lived in. She actively volunteered her time to Minor Hockey, Minor Lacrosse, Junior Lacrosse, Junior A Hockey billet parenting, Shuswap Women in Business, Salmon Arm Downtown Improvement Association, Salmon Arm Rotary and United Way . 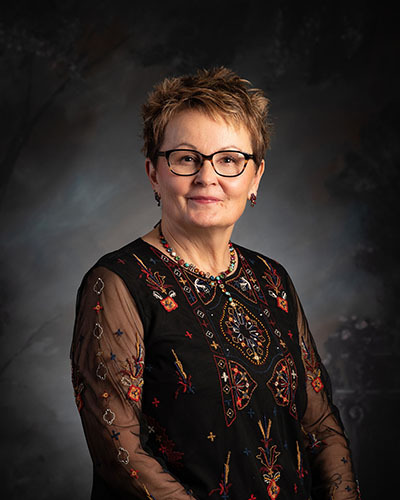 Upon her arrival to Okotoks she immediately involved herself with the Foothills Country Hospice, Okotoks Chamber of Commerce and the Okotoks Jr. A Raiders Lacrosse team. From the moment Dawn had her first personal experience with a dear friend’s Hospice care in Kamloops B.C. she knew she wanted to be a part of hospice. She feels very fortunate for the opportunity to hold the Executive Director position at the Foothills Country Hospice. She is committed to honoring the values, and will continue to carry out the vision and mission that are an integral part of hospice care. Dawn and her husband Kevin have been married for 25 years and have 2 sons.